Ever since we took non-allergic kid #2 with us on a trip to Napa and Sonoma Valleys six months ago, pretty much eating our way through the countryside, I’ve been wanting to re-create some the best treats we had for allergic kid #1. 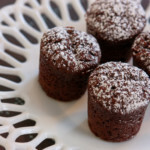 This is my version of the Chocolate Bouchons from Bouchon Bakery in Yountville. The silicone mold is from Williams-Sonoma (that company is incredibly adept at getting me to stimulate the economy). This is also my basic dairy and egg-free brownie recipe, no fancy or crazy ingredients, making it easy to embellish or take as it is. 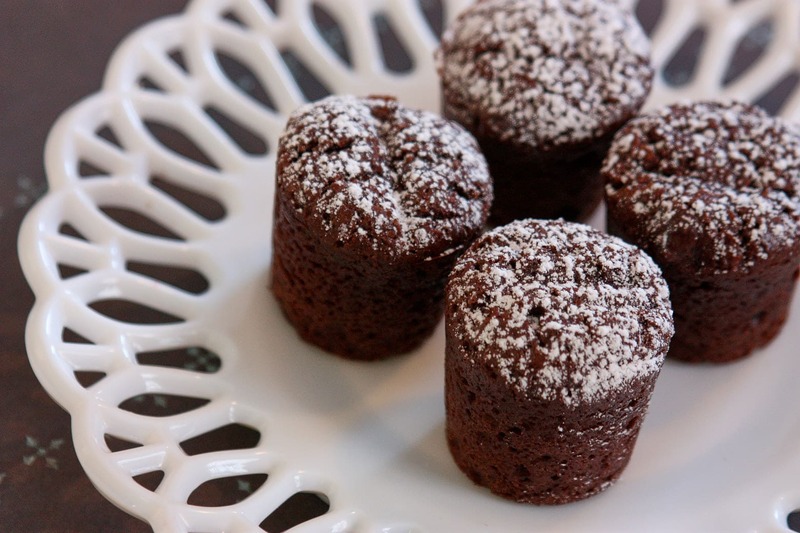 The great thing about this brownie recipe is that it can be made as a “brownie mix” in advance. Just put all the dry ingredients, plus the chocolate chips in a ziplock bag, and when you want to bake, just dump it in a bowl with 1/2 cup of water and 1/2 cup of oil! In a large bowl, mix the dry ingredients and the chocolate chips together. Add the oil and water and mix well, but don’t over-do it or you’ll have bricks. Spread into a 9 x 9 inch baking pan, or spoon into your Bouchon molds! Bake for 25 minutes, or until the top is no longer shiny. Let cool before trying to cut or they’ll crumble apart. mmm, brownies. I love the cute shape of them, your picture turned out lovely! These look fabulous. I'm so glad Dr. W gave me your website address today. My son, age 2, is allergic to egg, dairy and peanuts and our daugther, age 9 months, is very rashy and just had a horrible reaction to dairy a couple of weeks ago. Thank you for taking the time to post your recipes as we struggle to give our son a variety of good foods. love it!!! they're so cute! I just found your site – and I don't know how I have lived without it so far!! 🙂 Your recipes are wonderful! I wish I was that creative! I'm so impressed! I am a fellow allergy mom….my son is 18 months old, allergic to milk, eggs and peanuts. It has been a very interesting road learning how to manage his allergies and still keep things as normal as possible – but SAFE! Many times I get the look of "how do you live without milk and eggs???" – which I hate! However, I calmly tell them that there of alternatives that are just as wonderful! Anyway, I don't want to ramble. Just wanted to tell you that I love your blog! Hi again! We have been "speedbump kitchen-ing" again. 🙂 I made these brownies last night and I have to tell you they taste better than any brownie I have ever had!!! Fantastic! One question, I made them in a 9 X 9 pan and they are really, REALLY crumbly. Do you have that problem with this recipe? Is it better to use a certain oil? I used canola. Thanks, again. I've been following your site for a while now and have just been able to stock up on allergy-free ingredients and get some homemade baking done! My husband weighed in on this one, and he agrees that some batches have been more crumbly than others. I'll have to do a more scientific evaluation of this, but my guess is that my less crumbly batches recently have been the ones I have been a little more aggressive on the final beating process. The beating causes gluten formation…usually not a good thing when making muffins or cupcakes, which is why those are mixed carefully…but in this case a little gluten-toughness allows them to stay together better. So I'd say try whisking the final batter a touch more, not beating the heck out of it or anything or you might have bricks, but just a touch more beating. Thank you! Not to be defeated by a batch of brownies, I made a second batch last night. Perfect! I think I probably beat them just a little more and I definitely made sure they were done before pulling them out of the oven. Taste fantastic and hold together perfectly. You are a persistent Queen! May the Meatloaf Fairies be with you! Just found your blog and love your recipes. I have an online store for people battling food allergies and intolerances. One of the resources I provide my customers are new recipes to try at home. I feature recipe cookbook authors/bloggers with full credit given and links back to their sites. I also promote you via my press releases, newsletters and social media outlets. Please let me know if you would like to participate. I look forward to hearing from you. these turned out great! i may whip a little more next time. thank you!!! i have an allergy blog but i do a lot of "researching" safe recipes and COPYING! i give credit and will definitely tell my readers about you! thanks again! now onto hershey syrup and BBQ sauce! LOVE these brownies! I didn't think I would be able to make brownies from scratch without milk and eggs for my son. Got great reviews even from my family members that don't have food allergies.